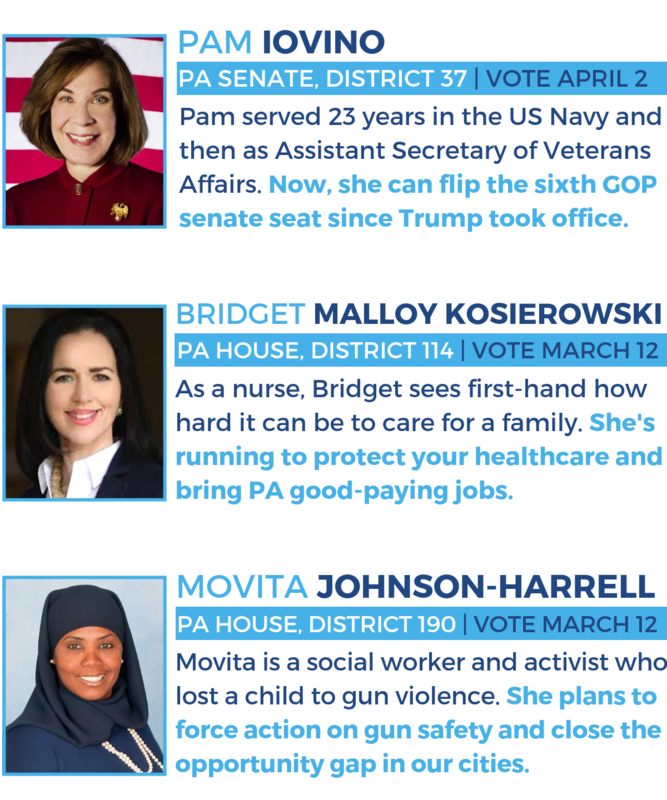 Democrats across Pennsylvania are rallying behind our first candidates of 2019: Pam Iovino (SD-37), Bridget Malloy Kosierowski (HD-114), and Movita Johnson-Harrell (HD-190)! All three women will be on the ballot in the year’s first wave of special elections, taking place March 12 and April 2. Every vote for Movita, Bridget, or Pam is a vote for progress on Democratic priorities: raising wages, improving our schools, protecting the environment, and building a safer and fairer commonwealth for all. Visit our candidates page to learn more about these future legislators, follow their campaigns, and volunteer to help them win. Donate here to power our grassroots campaign electing Pam, Bridget, Movita, and other special election candidates across PA!